So, Wikipedia was a revolution. Earlier, there was a time when you had to actually pay to get an encyclopedia. Don't believe me? You don't probably remember. That's because of Wikipedia. See the tagline in the logo on the left? It's Wikipedia - The Free Encyclopedia. Now, Wikipedia is not an online encyclopedia maintained by professionals. It's a wiki site. Meaning, it's built and maintained by the users. Volunteers from all over the world help in writing for and proofreading, then editing and updating all the content on the website. There are others who help out in various other things. Some people help in patrolling the new articles on the encyclopedia, and some maintain a group of people who edit out typos, fight back vandalism, remove out spam links, clean up articles, maintain lists of most wanted articles, and also lists of photos to be edited. Everything has a beginning. Remember that, everywhere. This also applies to your being a serious Wikipedia volunteer. Depending on the type of person you are, you will find this fun too. If you're like me, you'll really enjoy contributing to Wikipedia, knowing that there are many people reading what you write. Having an account let's you easily set your own preferences on Wikipedia, like your time zone. Many things you do on the site requires an account. Some also require an account that is a couple of weeks or so old. You can save a log of all the edits you have done on the site. The history of an article will list your name as a person who modified it, with timestamps. If you don't have an article, your IP address will be tracked, and will be displayed publicly in article histories, when you do anything on the site. "You irrevocably agree to release your contributions under the CC-BY-SA 3.0 License and the GFDL." The first license is explained very clearly in the link itself. The GFDL may be a little boring to understand on the linked page. If you are interested in knowing more about it, refer to this FAQ. Okay, so, you want to start off editing Wikipedia (and writing your articles). You need to remember that you won't vandalize or infringe copyrights, as it could land you in serious trouble. I know, I know, you already understand everything. Don't blame me later for not giving a heads up. I know it was my job. 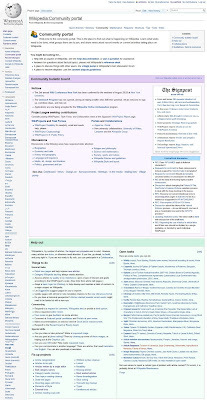 So, I started off editing Wikipedia by going initially to the community portal. Now, this is an important little page. You'll be heading off here for most of the things you do on the website. This page is for all the volunteers to start off with things. It has all kinds of important links and places to go to. What I started with is patrolling new articles. This can be very helpful for someone beginning to learn the wiki language. You get to see the new articles that are badly designed, and you get a chance to improve them. You can see the list of new articles written recently over here and a guide to the basic things you must do here. You could also start off with other kinds of work available there. But I recommend doing what I mentioned earlier. There's a lot of stuff to do for everyone, and there's never a shortage of people doing any kind of job. Well, every dumb person knows how to get to the page where you can edit any article. But still, it's my job to explain every detail. You click the button on the top of the article that says 'Edit' (duh!). I have suggested that you begin with a new article. Remember that you need to give the article some time after it has appeared on Wikipedia, because the one that has gone live may be a draft and it is still being worked on. Wikipedia suggests that you wait for about half an hour after a new article has been put up. You can see the time when the article was saved on the new articles page itself. So please choose the articles that have been written a while ago. You won't believe me, but I have noticed that there's a new article on Wikipedia every seven or so minutes. Some of them are worthy of deletion, however. Expand on it (add more info if you know anything, or create an infobox). Add photos to it, if you have any free ones available. Mark it as a stub, if it is small, and pass on the message to the community to expand the rather short article. Simply add tags (like 'clean-up required', or 'wikify', or 'add references'... yes, I know you've seen them before). Do anything else you want. This is a simple way to cover up anything I have missed (LOL), but sure, there's a lot more one can do. People who have not experienced this will say So what? It's not what it seems. 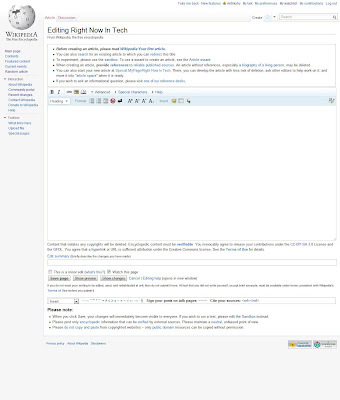 Wikipedia provides you a completely blank space and says, Go ahead, write your article. Show me what you got! That's scary. You don't have an idea of what to do next. The reason I told you to start off with patrolling new pages was that you would be exposed to simple, clean new articles. 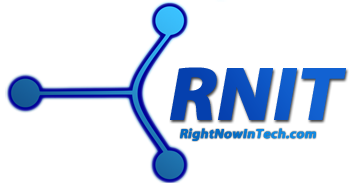 You will be able to see how people go about writing articles, and how things are written. You understand how new sections are created and how subsections are made. Then you will be good to go with writing new articles. Now, I am here to show you what exactly you need to do your first basic edits. Don't worry. Okay, so, let's begin systematically. When you get a blank slate, what do you do? How do you figure out what you write ends up where? Remember, whatever you write in the blank slate, ends up becoming the introduction. Know what that is? It's the little (or big) paragraph under the title, before the contents box. The contents box gets added automatically when you add sections, so that's a little less work for you. Don't worry about it. See, they were typical Wikipedia articles on various types of topics. See the introductions for all of them. You don't want to be overly detailed to make the intro long when you first write the article. There's nothing wrong in starting out an article as a stub, by the way. You can add in more info later, or let the others write in it. To be precise, the introduction summarizes the entire topic for the reader. It gives basic facts, and when required, the pronunciation and its writing in native scripts. It will appear as a blue link, and will lead to the article. So simple. If you write something that doesn't exist as an article, it will give you a red link (yes, it is called a 'red link' in Wikipedia jargon), and will have the same result on clicking it, as it would when you searched for it. Wikipedia will understand you, and will display only 'Meteora', and will still link to the album's article. It will look like this: Lifehacker. But you won't find yourself putting in too many external links, except in the special 'External Links' section you can create in the end of an article if you want. For citations, there's this thing called 'References', which I have explained in detail in the later part of this article. You can use basic HTML language in articles too. Formatting codes work, and you can write in subscript or superscript too, using HTML tags. You won't be usually writing much in the intro. Most of the time, you'll move on quickly to the main body of the article. It is composed of sections, and under them, the subsections. This will be (arguably) the most important thing you'll be wanting to know in formatting (yes, inserting photos is coming up). Of course, here too, you replace 'Subsection 1' with the subsection's title. An example of a subsection can be seen in the Meteora article. See the 'Special Edition' and the 'Tour Edition' subsections under the 'Other Editions' section? Just like that. Another very important trick to have up your sleeve is putting in bulleted lists. It's similar to the numbered lists above. Only that it has bullets. To put in bullets, put in asterisks (*) instead of hash signs. Now, let's move on to putting in tables. 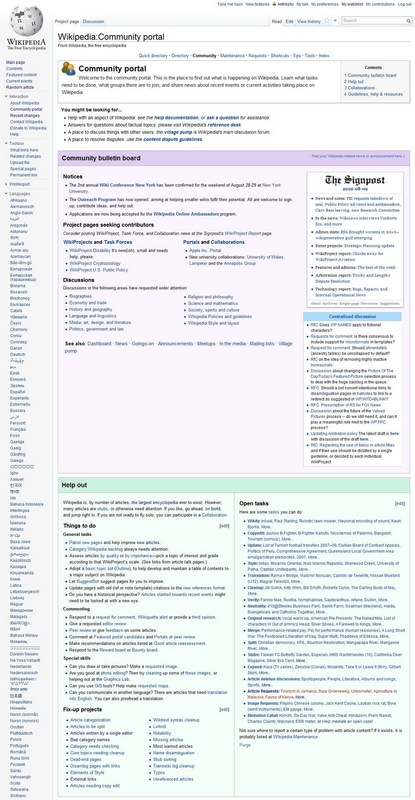 The Wikipedia redesign has made it easier to edit pages. Now, it's much, much easier to add in tables compared to before. You now just click the Add Table icon on the bar at the top of the editing box, which is shown in the screenshot alongside. Here, you can set your table options. Select the number of columns and rows. If you want a header row, check the first checkbox. Choose your settings and hit insert. You now have some apparently random bits of wiki code in your article. Now, you need to modify this random code to add in entries for your table. Replace the 'Header Text' in order for the headers of your rows. Replace the 'Example's with your entries. Look at this section of Michael Jackson's article to see a very good example of table. if you look at the source of the section, you may see a number of reference links, so it may be an unkempt haystack for you, but if you look carefully, the code is structured like a table I explained to you. We are now moving more towards slightly (remember, the emphasis is on 'slightly') harder wiki language. Always remember, if you're not sure about what the coding may be like, refer a similar article, and view its source. I do that all the time. It always helps. To use any kind of multimedia item on a Wikipedia article, you first need to upload it to their servers. You can then use it on any of the Wikimedia sites, like Wikitravel. To get to the upload page, type in (why couldn't they make it simpler?) 'Special: Upload', without the quotes. Now, before you do anything, think again if you are permitted to use the image on Wikipedia. First, scroll down the page to see the dropdown menu for selecting a license. Now, there are plenty of options, so choose the one that applies. You CAN upload a logo, album cover, book cover and many other things that you may think is illegal. Don't worry, if there is something wrong in the image, it will simply be removed. If it is any kind of copyrighted item that CAN be uploaded, you must add a fair-use rationale in the description. You should just include that it's being used for educational purposes and there is no free substitute (be sure of this) that is available anywhere. See this page for help on using a fair-use rationale. As with Wikipedia always, it is really complex. Now, once your file has uploaded, you can use it on a page by inserting something like this. The image will be inserted into the article. Chances are, you will want to align it to the right of the page. So, add a pipe symbol (|), by pressing Shift + \ after .jpg and add the word 'right'. To add a caption below the image, insert another pipe symbol again, and type in 'thumb', and then another pipe symbol, followed by the caption you want (you can insert links into it too). Resize the image by typing in the height in pixels. For example, the book's cover in the Planet Google article is 200 px. You can experiment with various numbers and then Preview the article again and again before saving it. Note that you can insert these words (the ones between pipe symbols) in any order as you like. This is one very important thing that you'll want to put into an article. Other than giving quick facts about someone or something, it also gives your article a professional look. It's relatively hard to create, but you can do it without much help if you do it once or twice. This is something people may call a 'factfile' (I used to, until I came to know that it is 'Infobox' in Wikipedia jargon). To the left, you can see a part of the infobox on the Facebook article. So, before you create an infobox, think of what kind of a thing the article is about. 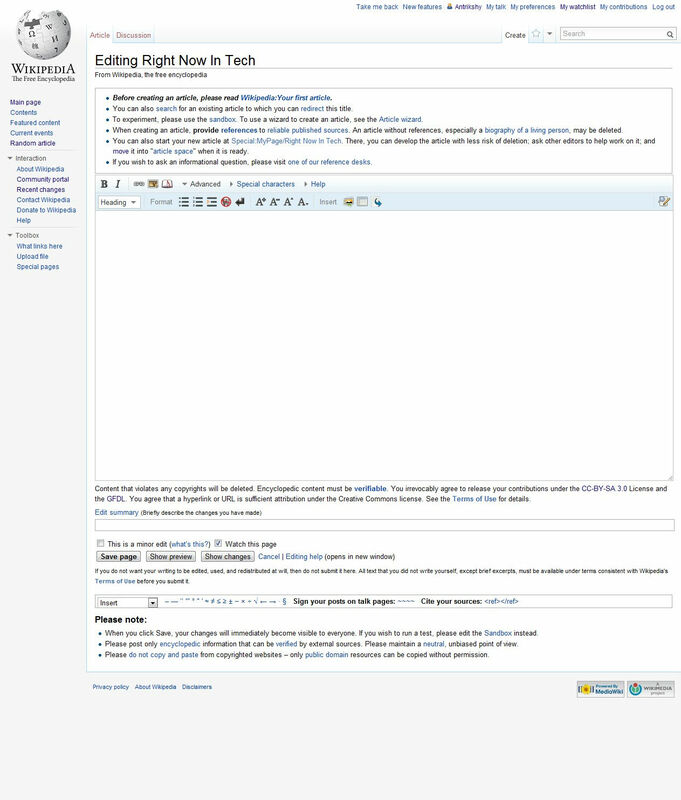 There are a variety of infobox templates on Wikipedia, like those for a company, a school, a person, a website, a film, a book, a video game, and whatever else you can think of. The Facebook infobox on the left is an example one that uses the 'dotcom company' template. Here's a pretty complex list of infobox templates. See the 'Subcategories' section. Now, you are probably asking: Hey, why these templates? Well, the templates are set into the Wikipedia language, and if you specify one, you can use various features of each, depending on the article you're writing. Like, here's the page for the infobox of a book (and you can look up templates for other things too). You can copy the template from such a template page into your article and start filling in the info. Remember, you DO NOT have to fill it completely. In most cases it cannot be filled. When you have filled in the facts, you can preview the article. You'll notice that it will use natural language. Always remember to close the infobox with the curly brackets like you started. Otherwise, nothing will work, and you may be forced to think and think for a long time on what's wrong (it has happened to me). You may in some cases, lose some of your hair and/or injure yourself and/or others. Well, that covers up all you need to know about infoboxes. This is a boring section, but it is required on every article. You may not put it initially, but you can always add one later. Now, the basic concept is that Wikipedia has to be as accurate as it can be. So, you need to back up whatever you write with other articles, like those on other websites. So, to add references to anything, the simplest way is to add a citation after the sentence in question. For this, there should be an opening reference tag after the sentence, followed by the URL of the site you wish to link to and there should be a closing tag. For those who don't know HTML or other web design languages, the previous sentence was an utter mess of words ('jargon' is the word I like better for such situations, and this is the fifth time it is appearing in this article). Clicking that citation will let you jump to the bottom of the page, which has a list of references, and you'll find all the links there. If you're wondering what will happen if you don't put it, in simple words, none of your citations will work, and you'll get an error at the bottom of the article. So, that was pretty much everything you probably need to know about editing Wikipedia articles. This should cover most basic stuff, and give you a headstart to volunteer for Wikipedia. Whenever you're editing an article, refer to this post. You may want to bookmark this in your browser. Press Ctrl+D for that. So, always keep this in mind: There's a lot more left to learn, and you'll probably learn all that in the long run. This article doesn't even cover up 10% of what a Wikipedia volunteer needs to know. Remember, improve Wikipedia, write more and more for it, maintain standards, and don't vandalize.